Readerware 4.01 has been released. This release addresses a few issues found in the initial Readerware 4 release. Also in this newsletter, a new Windows installer and Readerware on a Chromebook. A full list of the changes included in Readerware 4.01 is available in the release notes. You can also access the release notes from Readerware itself, select the Help->Release notes menu item. This is a minor upgrade that is recommended for all Readerware 4 users. We have restructured the Readerware Windows installer to make it more anti-virus software friendly. For a while now Readerware users have had problems installing Readerware on Windows systems. Most Windows users run anti-virus software of some kind and these are getting more and more intrusive. One issue that has caused problems is real time scanning. What this means is that as soon as your anti-virus software notices a new file on your hard drive, it scans it. As you go through the Readerware installer, your selections determine which files get copied to your hard drive. The way things used to work is that we would copy the standard files and then process your selections which would result in copying different versions of key files again. The problem was that in some cases your anti-virus software was already scanning the first file copied and the installer was unable to copy the new version. We have restructured the installer to only copy each file once. Hopefully this will mean an end to copy errors. If you do run into problems installing Readerware 4.01, be sure to let us know. But wait that is just the beginning to the changes made to Readerware Windows installation. Readerware regularly checks for updates and notifies you when a new version is detected. You can determine how often Readerware checks for updates, by default it is every 7 days. To change this, select the Preferences menu item, then Update. You can change how often Readerware checks for updates. You can also turn off the update check, although we do recommend you leave it on. There is also a Check Now button on that page which will check the website for an upgrade. The built in upgrade check notifies you when a new version is detected, it will let you open the download page in your browser and you can download the update. This is where the big change comes in, but you will not notice it until we release the next Readerware upgrade. When a new version is detected Readerware 4.01 and beyond will offer you two choices, Download Now and Go to Website. 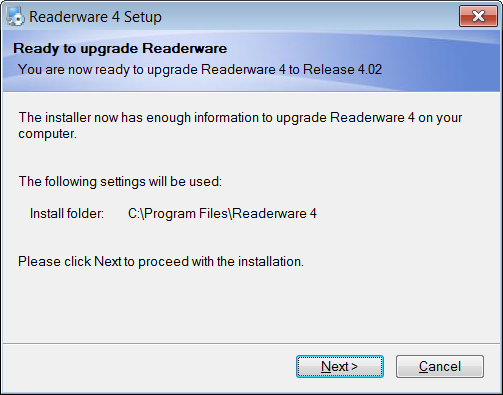 If you click on the download now button, Readerware will immediately start downloading the new 1 click upgrade installer. When you restart Readerware the upgrade will be installed. No more visits to the web site, no more lengthy install procedure answering the same questions each time. Of course you can still use the old approach if you want. Why would you? Maybe you have Readerware installed on multiple machines and only want to download the installer once. Maybe you always change the Install Options page in the installer, in this case you should download the full install. There is one thing that hasn't changed, you are still in full control when it comes to upgrading Readerware. Others are now performing automatic upgrades, they decide when you will upgrade and you only find out about it later. We still ask you if you want to upgrade, you can always hit Cancel and nothing will change. If you use the new download now function, the new one button upgrade installer will be launched the next time you restart Readerware. Changed your mind? Hit Cancel and the installer will close and you are still running the old version of Readerware. We have written articles about this in the past, but it is worth repeating. You should not store your Readerware database on a cloud drive like Dropbox, OneDrive etc. It is easy to think of cloud drives as backup drives, but they are more than that. They sync files across multiple devices. They can be very useful, you update a document at work, at home you add some more changes, and the next morning you have the latest version available at the office. The ability to sync files across devices is very useful, it is also the problem. A Readerware database, any database, has a complex structure of data and indexes. If a cloud drive tries to merge changes between different versions of a database, they will end up corrupting the database. One change we made in Readerware 4.01 is the ability to recognize that a database has been stored on a major cloud drive and display a warning. We don't prevent you from storing your database on a cloud drive but we strongly recommend against it. We don't prevent it because if you really understand the cloud drive concept it can serve as a backup drive. In Readerware 4.01, if you try and create a new database on a cloud drive, we will recommend against it, but you can go ahead. If we detect that an existing database is on a cloud drive we will urge you to relocate it using backup and restore. The warning will be displayed 5 times and then it will go away. If you know what you are doing, you can use a cloud drive. If you are not sure please heed the warning. One change we made in Readerware 4 was how we handle accented characters in names. When you type into a Readerware contributor field, the type ahead feature selects the matching entry. Most web sites will include accented characters in names so as an author or artist is added to the database, their names may include accented characters. That is not a problem if your native language uses these accented characters because your keyboard is set up to handle them. In other countries it can be a real problem because entering an accented character can be very difficult. For example one user had books by "Sánchez, Carlos". He wanted to search for books by this author so he enters "sanc" in the author field and got no matches. If he had entered "sánc" it would have worked, but that is just not practical on a US keyboard for example. So in Readerware 4 we ignored accents when you type into a contributor field. Type "sanc" and Readerware could select "Sánchez, Carlos". In the music program type "sine" and Readerware could select "Sinéad O'Connor". This makes it much easier to search your database for a favorite author, artist or actor etc. Unfortunately in our initial implementation it broke things if you were say in France and were entering accented characters on your keyboard. For example typing in "Hàn" and Readerware could select "Hannah, Sophie". Not helpful. This has been fixed in Readerware 4.01. Just in case this new feature causes other problems we have added an option to turn off the new behavior. Select the Preferences menu item, then Contributor. There is a new option to Strip accents in search type ahead. You can disable this if you run into problems. Be sure to report the issue though so that we can address it. We get asked this question a lot. Let's start by discussing what a Chromebook is. It looks like a normal laptop and it is, but it is running a very different operating system, Chrome OS developed by Google. The type of applications a Chromebook runs are also very different from normal applications. They are cloud applications, the application itself is running in the cloud and you are interacting with the remote application through a client running on your Chromebook. Because of this most Chromebooks have very limited internal storage, you data is in the cloud. So the answer to the question will Readerware run on a Chromebook has always been No. But due to major changes in Chrome OS, the answer is now Yes, Readerware will run on a Chromebook and it actually runs surprisingly well. A while ago Google added support for running Android apps on Chrome OS, so you can now run the Readerware Mobile apps on your Chromebook. Recently Google added support for running Linux applications on Chrome OS version 69. This is where it gets exciting. Readerware is available for Linux and you can now run the full version of Readerware on your Chromebook. In this article we will show you how to run both the mobile apps and the full version of Readerware on your Chromebook. First the bad news, not all Chromebooks support these new features. If you have a Chromebook, it is easy to determine whether or not they are supported. Go to Settings. If there is a section entitled Google Play Store, you can run Readerware Mobile apps on your Chromebook. You should enable this setting. If you have a section entitled Linux (Beta), then you can run the full version of Readerware on your Chromebook, again you should enable Linux support. If you don't have a Chromebook and want to get one that you know will run Linux applications, good luck. Unfortunately there is no definitive list of Chromebooks that will run Linux applications. The various vendors do not list this feature on their web sites, I expect that will happen but we are not there yet. Google publishes a list of supported motherboards. They publish another list by manufacturer of what boards they use in each model. Working with these two lists and searching Amazon, it is possible to find the Chromebook you need. It is a lot more difficult than it should be though. We went with an Acer Chromebook 15, model number CB515-1HT-P39B from Amazon at $349.99. It is currently selling on Amazon for $319.99 with free Prime shipping. It has a 15.6” full HD display, Intel Pentium N4200 processor, aluminum cover, touch screen, backlit keyboard and up to 12-hours battery life. The screen is not detachable but does have a 180 degree lay flat design. It does not have an HDMI connector but with a USB-C to HDMI adapter you can display the screen on a large screen TV or projector. The unit we received was running an older version of Chrome OS. So you need to check for updates and make sure you have Chrome OS 69 or better installed. So lets take a look at what it takes to run Readerware Mobile and the full version of Readerware on this Chromebook. The focus of this article is Readerware 4 Client/Server Edition. The assumption in this article is that you have your Readerware server running elsewhere and you want to connect to it from your Chromebook. You have to enable Google Play Store support on your Chromebook and then the Play Store app will appear in the Chrome Launcher. Run the app, search for Readerware and install, just as you would on an Android device. The Readerware Mobile apps you install will now appear in the launcher. Run the app and sync it to the Readerware server. As you will be running the mobile apps on a large screen you might want to go to Settings first and choose a large image size and check the option to double the image size in the detail view. There was one thing we noticed about the actual sync. We have set up our network so that we can refer to machines by name, but connecting to the server by name did not work from the Chromebook. We had to use the IP address instead. Once synced you can browse your Readerware databases as normal, just like on your Android device. As this Chromebook has a touch screen you can use touch just like on your phone, but you could also use the mouse if you prefer. One difference is that when you enter something, like the IP address when syncing, there is no on screen keyboard displayed, you use the real keyboard instead. Everything seems to work fine, including the barcode scanner function. We did not expect that to work but when we hit the Scan button we got the normal prompt to install the barcode scanner app which went fine. When we hit scan again, there we were on screen. Hold up a book and it is scanned. If you prefer you can use a real barcode scanner instead. Unfortunately our trusty CueCat does not work with Readerware Mobile apps as we are not setup to decode the input. We will probably add that though, the scanner itself works fine on a Chromebook. If all you need to do on a Chromebook is browse and search your database, then this is an easy and great option. Unfortunately setting up Linux support on a Chromebook is a little more difficult. The only way to install a Linux app is using the command line or Terminal, I am sure that will change eventually. The first thing you need to do is enable Linux (Beta) support in Chrome OS settings. This will download and install Linux. It will take a few minutes. It will add the Linux Terminal app to the launcher. Next you need to download Readerware. Use the Chrome browser, go to the Readerware home page and select the Linux download page. We need to download the Linux package installer. The Acer Chromebook 15 we are using is a 64 bit machine so we downloaded the 64 bit Readerware for Linux package installer. The Chrome browser will download it to your Downloads folder. Now we run into our first problem. The Chrome OS and Linux file systems are totally separate. This is a good thing for security and stability, but it does mean we have to copy the downloaded file from the Chrome OS filesystem to the Linux file system. You need to run the Chrome Files app. It will display your drive. Select My Files->Downloads. You should see the file you just downloaded, right-click on it and select Copy. Now Select My Files->Linux, it will probably say there are no files. Right click in the file area and select Paste to copy the file. Now we are ready to install Readerware. That's it, Readerware is now installed. type exit to close the Linux terminal. The installer added the Readerware programs to the launcher and you can now run them. If you plan on using them frequently, right click on the icon in the launcher and select Add to shelf. Now you can launch the programs from the shelf. All programs including the loan client are installed and available in the launcher. Unfortunately I could not find a way to remove unneeded programs from the launcher, so I recommend that you add the programs you actually use to the shelf. The first time you run a Readerware program you will be prompted to register. Use your standard Readerware registration code, we can send it to you if you have lost it. You will also need to select the database, choose the option to Connect to a Readerware server. As mentioned earlier you will have to use the IP address to connect. You should now see your database. That is it you are ready to run Readerware, browse and search your database, auto-catalog, check books out with the loan client etc. Barcode reader support is available, even the CueCat will work with the full version of Readerware. There is one setting you might want to change. The default look and feel in the Linux version of Readerware is GTK+. You can change this by selecting the Edit->Preferences menu item, then General. Try the other look and feel selections to find the one you prefer. If using Hotkeys in Readerware, hold the Chromebook Search key while pressing the top row of keys to emulate a PC function key. i.e. Search + Reload is F3. You cannot drag & drop from the browser, but you can copy/paste the URL to add an item from your browser. Copy the URL then right click on the Readerware drop target and select the Add new item from the popup menu. No data is displayed in the window title bar on a Chromebook. Normally Readerware uses this to show the database you are connected to and the item you are viewing. The Display item at menu item does not work. Normally we display the selected item at the site you select but Readerware cannot find the Chrome OS browser, it is not accessible from Linux. There is a solution for this however, install a Linux browser in your Linux environment. We installed Firefox. Now Readerware will display the listing as normal, unfortunately this does not fix the drag & drop problem. 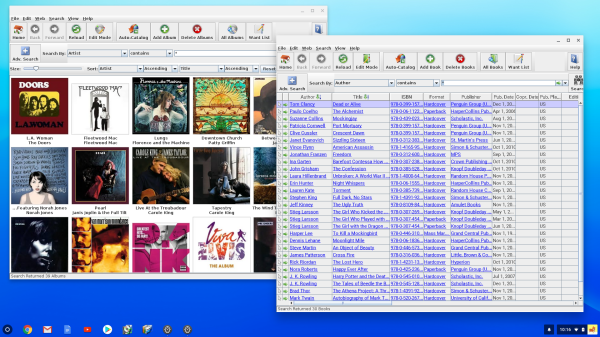 Sound playback does not appear to work in Chromebook Linux applications yet. The first time you run any Linux application on a Chromebook, Chrome OS has to start the Linux environment, that can be slow. Starting a second Linux application is much faster. Our conclusion is that running Readerware on a Chromebook is a very viable option, it runs well and works well. The Acer Chromebook 15 makes a very good, low cost, Readerware client. Other Chromebooks should work too as long as they have Linux support and a good CPU.